As I've ramped up my career as a UX designer, I have continue to build my reading list. Over the last six months I've read and returned to the books below - each of which offer a unique perspective on design and shed light on to the multifaceted nature of the discipline. If your looking to begin a career in UX design or are an seasoned designer, these books are must reads. View the presentation in Speaker Deck, here. And if you want, follow me! A few weeks ago, I began to dabble in some new prototyping tools, soon to realize, I was overwhelmed with the options and didn't know where to start. Prototyping can serve a number of distinct purposes and can take on different forms dependent on what you want to examine. At a low fidelity, a prototype can be a simple sketch to help visualize a product. At a high fidelity, a prototype can nearly represent the final product -- a fully functional product built with working code. The kind of prototyping you choose to do is largely determined as a function of fidelity and interactivity. Because of this, I wanted a quick and easy way to visualize this model to give me a better sense of when to use what and what tools would be best to accomplish my goals. Inspired by Kate Rutter, one of my mentors, I mapped out this graphical guide for prototyping. The graph on the left is a representation of different prototyping techniques you can use to test a product at different points in your process and the graph on the right shows you specific tools you can use to complete that kind of prototyping. Hope this can be helpful to others! In the last few years, UX has become a critical aspect of building digital products. Today, good UX is what often differentiates a successful product from one that fails. Because of this, UX has become a high priority for companies and an invaluable component of a business. So what is UX? And how can we define it to better understand it? Although somewhat helpful, it felt like an empty, unfulfilling definition. I found myself looking for more. I wanted to better understand how real people understood UX and then create a personal definition for myself. I teamed up with a designer friend, Cathrine, to do some guerrilla research, interviewing 10 people to better understand how UX is perceived. We looked to friends and strangers -- men and women, people young and old -- and aimed to talk to a group of individuals with a wide range of life and work experiences to help us answer "What does UX means to you?" Equipped with a notepad and iPhone camera at-the-ready, this is what we discovered after a morning in downtown San Francisco. Perhaps my biggest take away from the interviews came from the diversity of answers we received. Some baseline patterns emerged, yet it was clear that UX had many meanings for many different people. Some discussed UX within the context of digital products, while others talked about UX in the real world. Some talked about UX in relation to their feelings and world view while others, having no prior knowledge of what UX was, invented definitions on the spot! You can take a look at a video of selected interviews here. In all, I found that there is not a singular way to define UX. It's a fluid definition that changes depending on who you talk and changes with context. It's not just a term you can search on Google -- it has personal connotations. Finally, I defined UX for myself. User experience is about understanding people. It's about asking the right questions. It's about understanding context, goals, and how one achieves those goals. It considers psychology, experience and culture, and through design, informs how people interact with and experience the world around them. I would like to think of this definition as one that will evolve with time. As I continue to build on my experiences, I'll continue to grow my understanding of UX and how I define it. I'm excited to see how this will change over the year and throughout my career. Over the weekend, I read an article on Wired titled How AirBnB and Lyft Finally Got Americans to Trust Each Other. It was a fascinating look into the Share Economy and the critical role of trust in driving its success. The article highlighted personal narratives within the movement and provided context for the many peer-to-peer services that are taking hold across the country. As a big proponent of the share economy and user of peer-to-peer services like Lyft, AirBnB, CouchSurfing, and yerdle, I was excited about the article and began to take notes with paper and pen. Starting first in bullet points and pros, I found myself progressively moving towards sketches, visually communicating the ideas in the story. Sketching gave new life to my notes and provided a dynamic way to express what I was reading. Inspired by Mike Rhode’s Sketchnote Handbook, I decided to scrap my my written notes and instead, sketchnote the article. The share economy as a function of trust over the last 200+ years. Beginning pre-1800s, the share economy was able to succeed based on a sense of intimate trust. With advances of technology during the 1900s and mass migration to urban areas, trust was lost and proxies for trust emerged. Now with the help of the internet, modern devices, and peer-to-peer businesses, intimate trust is being restored and is helping to bring people together again. In the Sharing Economy, we’re not anonymous. Psychology tells us we don’t mess with people we know. “[The Share Economy] is not just building a business but fundamentally re-wiring our relationship with one another. Money feels secondary; an afterthought to the human connection that upholds the whole experience. For more on sketchnoting, check out the Sketchnote Army, here. A few weeks ago, I attended a pair design ‘TalkShop’ (talk + workshop) at Pandora facilitated by Suzy Thompson (Cooper), Chris Noessel (Cooper), Karl Dotter (pairdesign.co) and Kate Rutter (Tradecraft). Pair designing is much like pair programming — two designers work together on a single problem and collaborate to come up with a design solution. Design agencies and startups alike are implementing pair design as a method to push creativity, expedite learning, and improve workflow. Having recently been matched on a new client project with another designer, I was intrigued by pair design and wanted to learn how it could improve my process. Suzy and Chris kicked off the event by discussing their experiences pair designing together at Cooper. They reflected on how it’s important to utilize the experience and perspective of both designers within a pair but crucial that the pair works together, not merely side-by-side, developing independent solutions. Working as a pair helps to establish mutual ownership over the design process and avoids competing designs that lead designers to defend their own ideas over their partner’s. Designing together can also avoid mixing and matching aspects of two separate workflows therefore leading to a more coherent design narrative and cohesive solution. Design Pairing has been effective for Suzy and Chris, and through their experiences, they have developed six ground rules to help guide their process. Designing with a single marker allows for engagement and deeper listening. Often, one member of a pair will draw or design with a marker while the other observes and facilitates. At Cooper, they have defined these roles as generator and synthesizer. When having reached a design disagreement, time-box it. Allow for discussion and bring in a third party to provide a less biased perspective and try to help resolve the issue. It’s okay to have disagreements but don’t dwell on them. Cutting down others’ ideas can halt momentum and hurt a partnership. Build on your partner’s idea by adding to it, asking good questions, and seeing the solution through before jumping to criticism. Building can also help guide further ideation that wouldn’t have occurred if an initial idea was blocked and can build trust within a pair when sharing ideas. Showing gives your design partner material to work with, respond to, and develop upon. Telling keeps your ideas abstract or “in the air,” and subjective. Showing leads to more objective design conversations and greater understanding and collaboration. The success of the pair design process is dependent on your ability to check your ego. When designing, it’s tempting to drive your own ideas while ignoring others. Being able to champion other’s ideas allows for better design and happier designers. Next, Karl and Kate took the stage to facilitate a 15-minute pair design activity. Our goal was to take an existing mobile app and do a 15-minute pair re-design. I paired up with Kristy, a designer at AutoDesk and we looked to redesign Dropbox for iOS. We began our first with five minutes with goal setting and idea generation, jotting down notes on usability and visual style. Kristy had five minutes to draw while I took on the role of navigator. It was interesting to lead her through my design thoughts but challenging to convey my thoughts perfectly. I found myself holding back from taking the pen and drawing on my own. We switched. I took the pen and listened to Kristy as she walked me through her design ideas and revisions of our initial work. There were instances where I had to draw over my previous ideas (that was tough) and work together to come up with a better solution. In the end, we came up with a scrappy design to implement alternative ways a user could view and organize their folders on Dropbox’s mobile app. Although we were perhaps left with a less-than-perfect app redesign, we were able to work together and derive new ideas we wouldn’t have been able to alone. After the TalkShop, I took the lessons I picked up and applied it to my process. Working on a new client project with my partner, Cathrine, was a great opportunity to experiment with pair designing. Over the next few weeks we got to see how it influenced our work. As we designed, we had to be patient with one another, slow down and communicate about our decisions. We learned to agree and agree to disagree. We switched roles, taking the position of both generator and synthesizer and adapted quickly, complementing each other’s strengths and covering each other’s weaknesses. Pair designing offered pushback, a different point of view, and challenged us to question our designs and take them a little further than we thought we could. We also felt more confident about our designs after talking through them and had a much easier time when later meeting with our client. If you’re a designer, knowing how to work with others is already a necessary skill. Now design teams are taking collaboration to new heights, having designers pair on a single artifact and take shared ownership over each part of the process. Pair designing can help improve your workflow, push your design limits, and build confidence about your designs. Avoid working alone and start pair designing. For more on pair designing, check out Karl Dotter’s blog post here. As a UX designer, it's important to be able to communicate your ideas visually. Developing this skill takes time, effort, and an acute awareness of interactions among people, objects, and the environment. I like to learn fast and slow, immersing myself in an experience for an intense period of time then stepping back and to reflect on my what I learned. Last week I challenged myself to take a deep-dive into visual communication -- 100 sketches in 2 days. I was curious to see what patterns might emerge and how I might have developed as a visual communicator. Using 3x5 inch cards, Sharpies, and a grey marker, I sketched what was around me. My walk home from work, people on the street, and ordinary objects. I captured people, things, contexts, spaces, and flows. Below are 10 of my 100 sketches. Across the table from this. This weekend, I was fortunate enough to sit in on a portfolio review hosted by one Silicon Valley’s top interface designers. Due to issues of confidentiality, I can’t reveal his name or company, however, I can say that his work has influenced products that many of us use everyday. I can also say he’s a pretty great guy. Holding a two-hour session with a handful of my UX design peers, this is what I learned. Within the first minute of the session, we came to a stop. The order in which you present your work matters. Consider how you want to make a first impression. When you present your portfolio, you’ll be judged on how you make decisions — focus on demonstrating that first. One of my peers showed a usability study as his initial portfolio piece and walked us through how he conducted user testing to come to a number of design recommendations. The piece was great at demonstrating how to expose usability issues and illustrated the importance of user testing but it wasn’t effective at showcasing independent design thinking. For your first portfolio piece, make sure to set the tone by emphasizing who you are as a designer. It’s your responsibility to have a point of view. The difference between a designer and everyone else is that a designer is supposed to be aware of design and how to improve it. It’s important to be user focused but to not rely too closely on what users say. Often, users will provide you with symptoms of their problem but won’t have the vocabulary or awareness to truly get to the root cause. It’s the designer’s role to identify and synthesize user problems and think creatively about solutions. Having a clear point of view differentiates you from other designers and lays a foundation to inform your decision choices. As designers, we’re responsible for not only creating elegant products but also responsible for communicating about them. By nature, people respond to stories. Stories allow your audience to relate their own experience with the one you’re developing. Stories also present a clear beginning, middle, and end. On a foundational level, when talking about a portfolio piece, consider following this story arc — recognize, define, and develop. The power of prototypes and how to utilize them. Working at a design consultancy, documentation is often the primary deliverable to hand off to clients. When dealing with complex interactions, it’s not uncommon for documents to be over 100 pages long. Drafting these types of deliverables takes serious care, attention to detail, and significant time working at high fidelity in programs like Illustrator and Photoshop. The big concern is that when designers ship their work to clients, the final documentation doesn’t become the final product regardless of how well it’s crafted. In addition, documentation is inflexible. Often, the effort involved keeping things consistent when changes are made can be more challenging than creating the design itself. In all, documentation can’t always able to meet the evolving needs of a client when they prepare to ship their product and that is problematic. People don’t read products — they interact with them. Creating a prototype as a final deliverable allows for greater interaction with the product and a deeper-level understanding of how the product is experienced. It can also easily be adopted for usability testing and iterated on quickly and efficiently to push out new versions. Prototyping is also an impactful way to present to your client. People know how to interact with products. Demonstrating interactions with a prototype helps to spark well-informed discussions with clients and can lead to better design more quickly. When discussing prototyping, it’s important to understand the methods and know when to use them. Jason went over five prototyping techniques that he thought were important to utilize at different parts of the design process. — as you move through the design process. Creating rough, hand-drawn sketches of UIs to put in front of users for testing. When to Use: When you want to validate basic design ideas and understand rough interactions before going forward at a higher fidelity. Creating a presentation that quickly runs through an interaction at high fidelity. When to use: When you want to wow your client. When it’s more about the polish than the actual experience. If you need to sell an idea. Creating a set of static wireframe slides and discussing slide interactions. When to use: When working with developers and project managers to demonstrate a linear flow through an experience quickly and efficiently. Creating a clickable wireframe prototype that can be put in front of users. When to use: When conducting user testing or demonstrating interactions to clients at a higher fidelity. Creating a prototype that closely resembles the real product. When to use: When your product is nearly ready to ship. Presentation: Web browser, mobile device, etc. If you’re a UX designer, knowing how and when to prototype is already a requisite skill. Now, teams are transitioning from documentation to prototypes as final deliverables. Prototyping can make your design process more agile, allow you to express complex interactions elegantly, and present your work to your client in a more dynamic and iterative way. Avoid 100+ page documents and start prototyping. For more on prototyping, check out Jason’s blog post here. 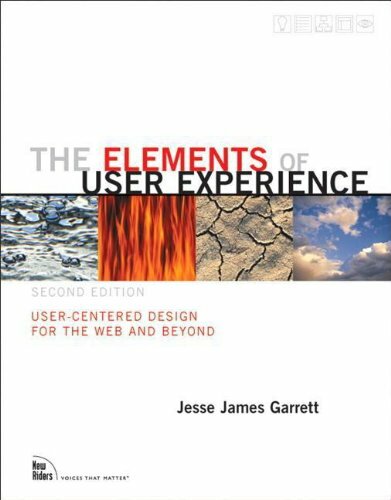 I recently picked up "The Elements of User Experience" by Jesse James Garrett, an essential read for all UX designers. In his book, Garret breaks down user experience into the five fundamental planes - Strategy, Scope, Structure, Skeleton, and Surface - and discusses the importance of each in the design process and how the planes interact to form a user-centered design. When building user experiences for digital products, this is a book I know I'll reference to guide my process. "The user experience development process is all about ensuring that no aspect of the user's experience with your site happens without your conscious, explicit intent." When developing good user experience, you need a plan. Designing UX is an iterative process that takes experimentation and development over time. It can be easy to get lost in the process and deviate from your initial design principles. Using Garret's five-plan framework provides an important reference to make sure that each decision you make is a conscious one and fit's within the scope of your project. For me, it will be important to create a simple outline to reference the five-planes of user-centered design as I develop an experience. “The most productive source for requirements will always be your users themselves. The best way to find out what people want is to simply ask them." Instead of sitting in the office thinking of what users want, go out and talk to them! This is what UX design is all about: understanding people and their goals. To be able to truly design a good user experience, you need understand the human component. Interact with the people you are designing for: get to know them and understand their context. Talking to users will save you time and energy as you continue the design process. As a UX designer, you must be able account for each of your design decisions. Every decision you make (or don't make) has a consequence. You need to be able to justify every step of the design process and be able to articulate your design decisions. Any design decision that you make will have an influence on the product as a whole and needs to fit into the user-centered design that you mapped out. My results from the Strengths Finder 2.0 test and why it matters. Last week, I took the Strength Finder 2.0 test to discover my top 5 talents and how I could use them to improve my personal and career development. 1) Individualization - Intrigued with the unique qualities of each person. They have a gift for figuring out how people who are different can work together productively. 2) Empathy - Can sense the feelings of other people by imagining themselves in others' lives or others' situations. 3) Relator - Enjoys close relationships with others. They find deep satisfaction in working hard with friends to achieve a goal. 4) Restorative - Is adept at dealing with problems. They are good at figuring out what is wrong and resolving it. 5) Arranger - Can organize, but also have a flexibility that complements this ability. They like to figure out how all of the pieces and resources can be arranged for maximum productivity. I recently joined Tradecraft, a 12-week personal accelerator program designed to train people to succeed in traction roles at high-growth startups. Before my first day of curriculum, I was encouraged to read the book Strength Finders 2.0 and take their test. From the reading, I learned that "people have several times more potential for growth when they invest energy in developing their strengths instead of correcting their deficiencies." It may seem obvious that our potential lies more in our strengths than our weaknesses yet, in practice, we seem not to take advantage of this fact. The reality is that we often tend to focus more on improving our weaknesses. Actually, this should come as no surprise. Overcoming deficits is part of our cultural narrative. We celebrate stories of the underdog, who triumph by conquering their weaknesses and beat the odds and often overlook stories of those who succeed by capitalizing on their innate talents. Although the former story may be more compelling, focusing on improving weaknesses can only benefit one so much. Beginning at Tradecraft, it will be as crucial as ever to use my time wisely and compliment my innate potential. I'm interested to see how my talents in the themes of individualization, empathy, relator, restorative, and arranger will propel me during this journey. I'm excited to further develop not who I want to be, but instead, who I already am. Take the test for yourself and find out what your top 5 strengths are here.